Finally…a day dedicated to ME! but, in my life, it really doesn’t mean a day dedicated to me…but it’s a day where my kiddos certainly try to make me feel special. Grace has been hinting around the last few days about what my favorite dessert is…I think she’s going to try to make me something 🙂 I let her know that something I would love to have is a friends recipe for an easy fruit trifle. 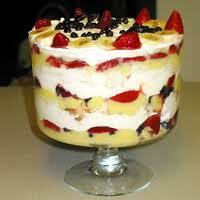 It’s a few layers of pound cake, vanilla pudding, fruit and whipped cream. It is SO yummy for my tummy! This isn’t it exactly but it’s similar…. And I also think that for dinner we might do a simple seven layer salad. Lately cobb salads have been what I have been wanting (and making)…but I don’t know anyone who doesn’t like a good seven layer scoop of goodness! I’ve been looking for recipes (which is why I’m blogging about food…again) and I think we will loosely follow the Pioneer Woman’s recipe for Layered Salad. I’ll let you know how our version went! I realized long ago that I much prefer the low key, stay at home and hang out kinda Mother’s Day. As much as I would like to be into going to spas and getting facials, I’m just not that kinda gal. I much prefer cuddling on the couch and watching a movie to having my face covered in mud! And I highly enjoy the homemade cards, extra kisses and hugs, and the memories we make together. This year it will be just me and the kiddos….Carl is in Norway for work. But I’m okay with that….the longer he stays gone, the closer we get to Annalea’s birthday and the higher the chances are that he’ll be home for that! What about you all….do you have any special Mother’s Day plans happening this weekend?